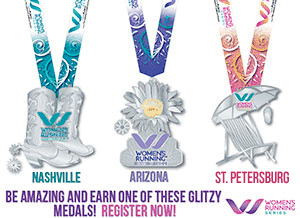 The Womens Running Series medals have been revealed for Nashville, Scottsdale and St. Petersburg!! Seriously, how cute are these medals? All Womens Running Series half marathon finishers will receive a one-of-a-kind medal with removable center charm. Add the center charm to any necklace or bracelet as a constant reminder of your achievement! All 5K and Half Marathon participants will receive this designer goodie bag as well! I am super excited to be part of the Womens Running Series in St. Petersburg. I will be running the Half Marathon on November 24th with my best friend Keri. Thousands of women runners crossing the finish line is such an inspiration. If you are a seasoned runner looking to PR or a new runner looking to accomplish your first 5K, this is the perfect series to get involved with. Click here to register today for the Women's Running Series and don't forget to use one of the discount codes above! You must be 12 years old on race day to participate in the half marathon and 8 years old on race day to participate in the 5k. All participants must complete the half marathon within the 4 hour course time limit, and all 5K participants must complete the course within 1 hour. To finish within the course time limits you must maintain a pace of at least 18:00 minutes per mile (or faster). Check out this video from the Fab 50 in St. Pete! So what are you waiting for? There are 102 days between now and your chance to sign up for the Women Running Series in St. Pete. Come be #BeAmazing with me! Yay! I am soooo excited to run this with you. I have wanted a Womens Running Medal for the longest time!